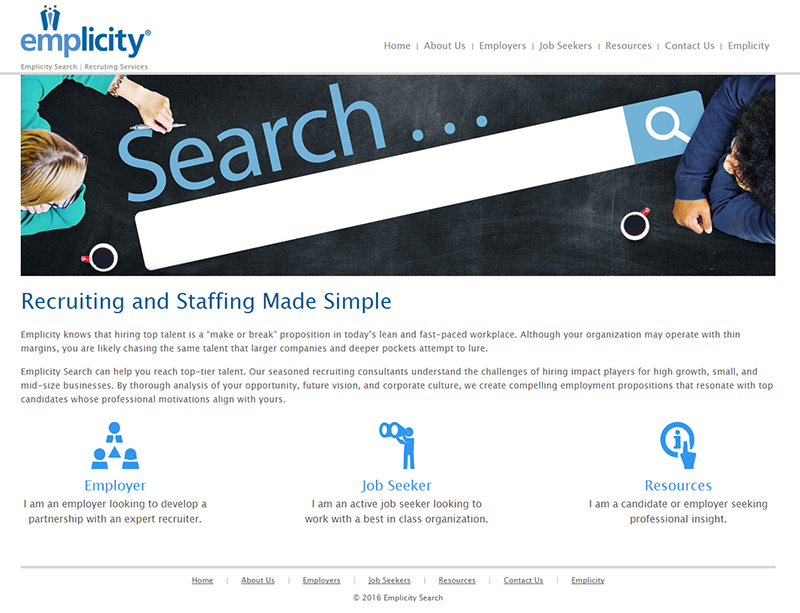 Emplicity is pleased to announce that Emplicity Search, the company’s recruiting division, has launched www.emplicitysearch.com in an effort to better meet the needs of its client sites and potential candidates. The new site features resources for both job seekers and employers to get the most out of the recruiting experience. “In today’s candidate-driven job market, partnering with a recruiter will help widen your company’s search for the top-tier candidates,” says Brandy Burbridge, Director of Recruiting. “You will only meet with the best of the best while Emplicity Search works behind the scenes to locate, screen, and present only what we feel exceeds every expectation of the position. Candidates are vetted and prepared in order to spend your valuable time in the most effective way.” Candidates and employers can get started on their search today. Visit www.emplicitysearch.com to see how we can help you fill key roles today.